Technology should enhance life, not complicate it. 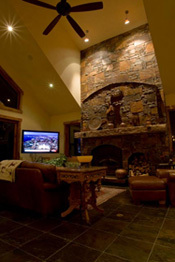 Our dedicated professionals at Advanced Custom Electric have extensive experience in the Audio/Video industry and can design a system that meets you and your family’s specific needs. Whether you want basic set-up and installation of your flat screen TV and surround sound system or whole house automation complete with a home theater we are here to make entertainment simple for you to use and enjoy. The increasing number of confusing remotes seems to be a common source of complication in today’s homes. Our professionals have solutions that will consolidate all of your remotes into one with a simple, reliable and functional interface. These newer integrated control solutions allow you to easily navigate between cable TV, DVD’s, satellite radio, iPods, gaming systems, etc… with the touch of a button. Along with these innovative remotes we also provide multi source, multi location home audio/video systems. 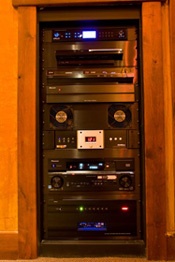 The features and benefits of having one of these modern systems is that we use a centrally located set of components to distribute music and video from a single out-of-the-way location throughout the home so different people can enjoy different media sources using their room specific controls. Through partnerships with quality manufacturers like Atlantic Technology, Nevo and Xantech we remain current of the latest electronics trends and control system technologies to offer you the ultimate entertainment system experience.